LeBron James can hypothetically turn the ball over 8 times a game, but as long as he dominates on both ends of the court, the positive always outweighs the negative. If his teammate Kevin Love comes out and gives a solid 20 points and 15 rebounds, but plays lax defense and gives up 15 turnovers to boot, that good play is completely wiped out by careless mistakes and broken play. Draft Day Sports: Pro Basketball 2017 is a lot like Kevin Love unfortunately. This sports simulator features a lot of the things you’d expect a game in this genre to have, but my experience has been mired with fatal flaws that perplex and frustrate me into a state of just wanting to move on to another game off the bench. As a simulator, DDS: PB17 is designed to give you front office and coaching control at a higher level, where it is your decisions and thinking, rather than ability to play, that determines wins and losses. There is a relatively small number of options you can take to tweak teams to your liking, however. Mostly, you’ll be tweaking sliders and making rash in-game changes to compensate for mistakes, which ruins the immersiveness of the title. The game does have a great menu system, where the icons and selections are all clear, and everything is accompanied by a simple instruction on what you are looking at. I really like how the visual icons stand out and give a quick indication on what you’re going into, and I’m also very happy that all changes take place in single window that you can easily navigate. The game leaves you hanging in terms of information being provided from “outside sources” however. The game starts in an offseason without much time between you and the initial D-League draft. There is no real daily “brief” or “white sheet” or anything to that effect. Games are fully simulated, but for some reason auto-substitutions are off by default. I ended up with 3 hurt starters after they played 48 straight minutes in the first game. To cap it off, I didn’t really ever realize that until several games later, because the only indicator I saw was a little white plus sign next to the hurt players. I assumed this was a “Hey, training is working!” indicator, and kept playing them. This is annoying, but easily remedied, and honestly if you’re someone who pours over the options painstakingly before you start, you wouldn’t have these problems. I figure most aren’t that way, and so frustration is likely coming. The game has the players and rosters ripped straight from the NBA, but the teams and other assets are completely fictional. While not having an NBA license is a drawback, I rather enjoy the work done on these faux-logos and team names, whereas most all sports games just kind of slop through that type of detail. DDS: PB17 provides professional grade logos that are reminiscent of the real world counterparts, while having an endearing quality. Character creation is pretty simple, where you select your attributes and have the option to upload a photo. It works fine, and you do get a bit of control on how your team will play from these decisions on philosophy. However, each time I tried to upload a photo, it never indicated a problem, and displayed fine in the menu, but never showed up once I got into the game, which is a huge bummer. The biggest of all blunders, however, is with a ill-conceived telephone option. This is designed to “call” your players and either change their tactics or reprimand them. Those are the only two options you have. The interactions are robotic and cold, and it’s only a telephone sound effect away from just being a menu. You have to use this individually for each play to change up tactics for games, and it takes forever. That is only the start of the woes there, because I also ran into a problem where each time I used the telephone option, if I tried to go back in and use it again, the choices were blacked out and unselectable. I had to save the game, exit entirely, and then re-load just to call each individual player. This is completely broken, and beyond that, useless, superfluous, and robotic. Once you get all of the settings in place, the in-game experience is somewhat enjoyable. You have two options to view, and both are basically the same 2D with a bit of action on screen. The games go by swiftly, and it is easy to change speeds, make changes, and sit back and watch. It can be a bit difficult swapping out players, because you have to do it while in timeout, and if the speed is higher than the slowest level, it’ll just move right past and you won’t be able to change the player out. The rest of the visual design of DDS: PB17 is atrocious though. The main color motif is a strange orange color that is off-putting, and I just don’t care much for the fonts or the overall scheme. The navigation works great, but the aesthetics are just bland. 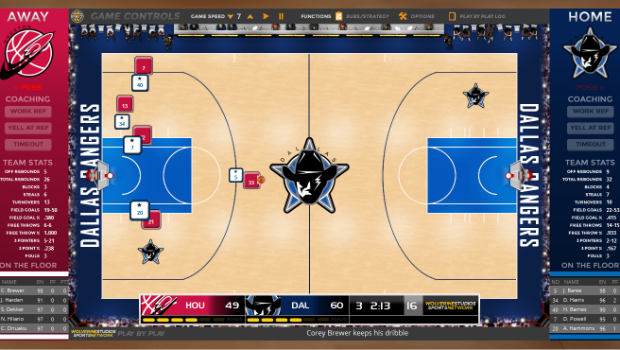 Draft Day Sports: Pro Basketball 2017 is a generic simulator that is just not quite ready for the big leagues. There are plenty of great features, and a deep collection of players that show the potential expected. A series of fatal flaws and poor design throughout will frustrate you and make you want to send it back down for more development.